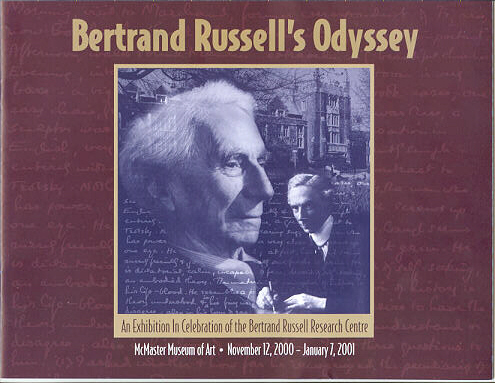 The Bertrand Russell Research Centre has published Bertrand Russell’s Odyssey: Exhibition Handlist, a wide-format photographic record of the exhibition held in celebration of the opening of the Russell Research Centre in 2000. Subscribers to Russell received a free copy of the brochure available at the time. This publication complements the brochure in both design and content. Sheila Turcon wrote the scholarly descriptions and took many of the 52 black and white photos. She and Carl Spadoni had selected the artifacts for the exhibition. Images of many of them appear here in print for the first time. Nicholas Griffin provides an Afterword. Please make cheque or money order payable to McMaster University. Print this page and mail it to the above address. Or telephone your order to 905 525–9140, ext. 24896. Our email contact is duncana@mcmaster.ca. Page maintained by Arlene Duncan. Last updated 15 August 2018.